This short adventure is the story of a cat who leads a double life as a secret agent. At the beginning of the tale the reader meets Roscoe and his sibling, Olive who have been rescued from a shelter. They have some difficulty adjusting to life with the resident house cat, Cayenne, but soon all become friends. Roscoe finds the life of a house cat very comfortable. 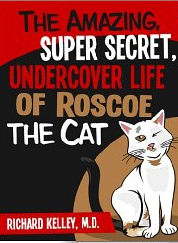 Still, Roscoe is a very strange cat in one respect; at night he becomes a secret agent prowling the area to solve whatever mischief is afoot. One night Roscoe notices a small tear in the cat food bag in the laundry room. He leaves his fellow cats to guard his warm bed spot and investigates. He thinks he knows the culprit but does not confront him. The mystery continues for a few nights until Roscoe discovers that a rat has been stealing the food. At first he is determined to kill him, but after looking the rat in the eye, he changes his mind. Roscoe discovers that the rat was cold and hungry so he broke in to find shelter and survival. Remembering his earlier fate, Roscoe persuades all the cats in the household to befriend him. Okay, this does sound a bit ridiculous that a cat who is the natural enemy of the rat would suddenly let him off the hook. However, the book does teach children that we can have empathy for those we have been taught are our enemy and all of us have the same basic needs and wants for survival. This book is filled with adorable photographs that children and adults will enjoy. Young children will delight in the book as a read aloud. It also makes a good beginning reader for children in the early elementary grades. The author is a medical doctor who is also a fitness expert. He has written books on health and the Christian faith. Kelley now has expanded his writing interests to include children’s books. If you and your family love cats, this book might be a good choice. If you enjoyed this post, please follow by clicking on the word Follow or by hitting the orange RSS feed button in the upper right hand corner. Nicely done! Love cat-mystery books. That sounds fab, my son loves spy books.